It is essential to your business that every vehicle in your fleet is properly titled, registered and insured at all times. The risk of fines is one thing, but an uninsured vehicle is a huge liability risk. 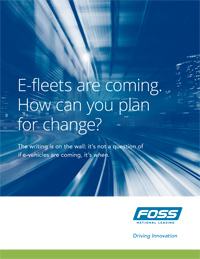 E-fleets are coming. How can you plan for change? It's not a question of if electric vehicles are coming. It's when. E-vehicles can provide significant benefits for many fleets. Find out if they are right for you. Under this program, we maintain a database of your entire fleet. Before each vehicle’s renewal, we review the vehicle’s status with you to eliminate any vehicles that are leaving the fleet. Then we process and distribute the renewals as per your specification. We pay any outstanding violations, if required, before renewal, and include the fee in your monthly invoice.